The folks at Seattle’s Best Coffee offered to send me a bag of their Level 2 coffee (Level 1 is the lightest and Level 5 is the darkest) to use in a recipe for their “Bright and Lively, Fresh and Fruity Smoothie” which has not only coffee, but fruit in it too. Now, I’m not a coffee drinker, but I love coffee flavored ice cream, candy, you name it, so I figured I’d give the smoothie a shot. I made the coffee concentrate in advance (thank you to my sister for giving me her old coffee maker months ago–I knew it would come in handy at some point!) and put it in the fridge to chill. The smoothie was simple to make–just throw everything into the blender, add ice, and boom, you have a smoothie. The texture was nice but the flavor was a little too strong for me, so I think next time I would add some extra peanut butter. Speaking of what I would add–here’s your chance to win a bag of level 2 coffee! Simply leave a comment stating what you would add to the Bright and Lively, Fresh and Fruity smoothie recipe to put your signature spin on it. Combine all ingredients in blender, adding ice until you reach desired consistency. Add Level 2 coffee grounds in the paper cone filter. Heat water to optimal temperature for coffee brewing (195 – 205 degrees Fahrenheit). Pour hot water over grounds. Once the hot water has been poured over the coffee grounds and the coffee has brewed into the carafe, remove cone and discard paper filter. 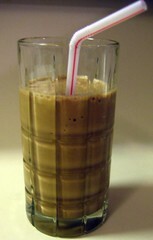 Coffee can be made ahead and placed in the refrigerator to cool down. Recipe inspired by Patricia Bannan, MS, RD, via Seattle’s Best Coffee. Giveaway ends at 11:59 p.m. EST on Sunday, November 13, 2011. One winner will be selected at random shortly thereafter and contacted by email. Please note this contest is only open to residents of the U.S.